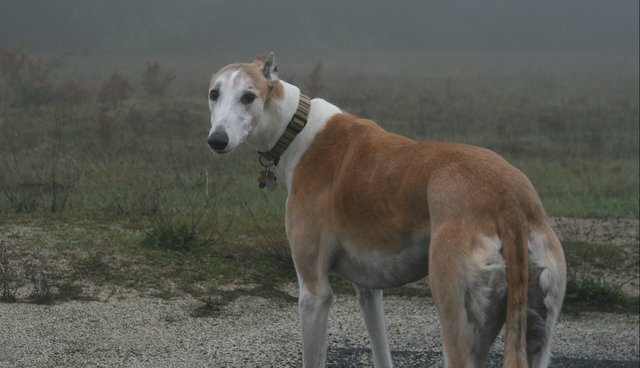 If the dogs are too old to hunt or too hungry to afford until the beginning of the next hunting season, then a greyhound owner might choose to hang them instead. Some throw them into wells or cremate them. Running them over with a car seems to be catching on too, while a few years back there were several cases of hounds being tied to the backs of trucks and dragged along the road. Beatriz Marlasca, president of a Spanish NGO dedicated to greyhound protection, told VICE of the intense cruelty she has seen toward former hunting hounds, including abandoned dogs eating garbage in the streets and pits full of greyhound corpses. Often, the abusers are difficult to track down or convict, Marlasca explained, and most of the offenders walk free. "Sometimes you feel like you've had enough," she said, "but then you realize that you can't give up." We go through a wide range of feelings in the process: indignation when we find a particularly terrible case and horror when we think how much the dog must have suffered. But the bond between the dogs and those who take care of them grow... Then they're adopted, and you feel proud and happy to think there's one fewer dog on the streets. We've had countless cases, some of them really miraculous. And Marlasca says the miraculous cases are the ones that make the entire endeavor worth the pain and anguish. "Some time ago, we found a female hound that had been hanged but was still alive," she said. "After a month under intensive care, she fully recovered and was adopted in France. That happy ending is what drives us. It's priceless to see the dog with a new family, sitting on a sofa, after all she went through. It's hard and beautiful at the same time." You can read the rest of Marlasca's interview here. For more information about her organization, Asociación Baasgalgo, you can visit their webpage. To find out what you can do to help end the brutality toward Spanish greyhounds, including adopting, fostering, or donating to help an abused dog, visit SOS Galgos.